I'm guessing it was a Christmas present. 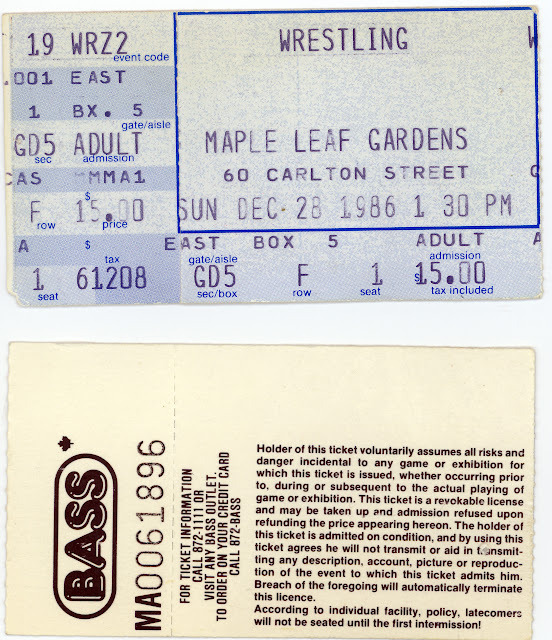 My dad got us a pair of tickets for Jack Tunney's next action-packed wrestling card at Toronto's Maple Leaf Gardens. It was a special matinee show on Sunday, December 28, 1986. Great seats, too - Golds in the back corner. 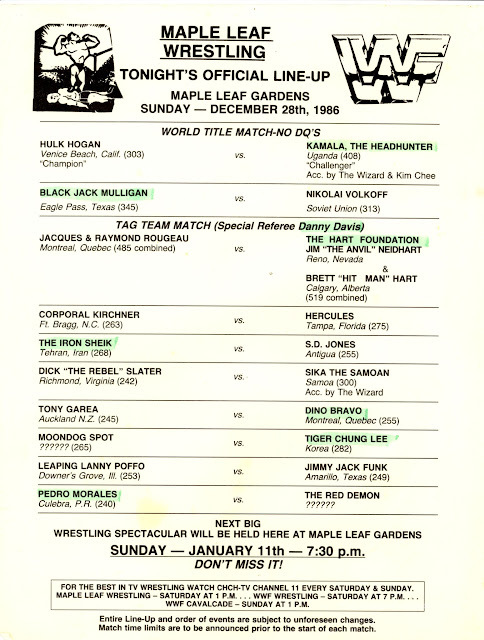 Much of the lineup looked like a TV taping - ten matches, mostly stars vs. jobbers with a few top names in the main events. The headline event was to be WWF champion Hulk Hogan taking on Kamala, the Ugandan Headhunter, in a rematch from their inconclusive bout at the Gardens a month earlier. But it wasn't a TV taping -- no TV cameras except for the local news. 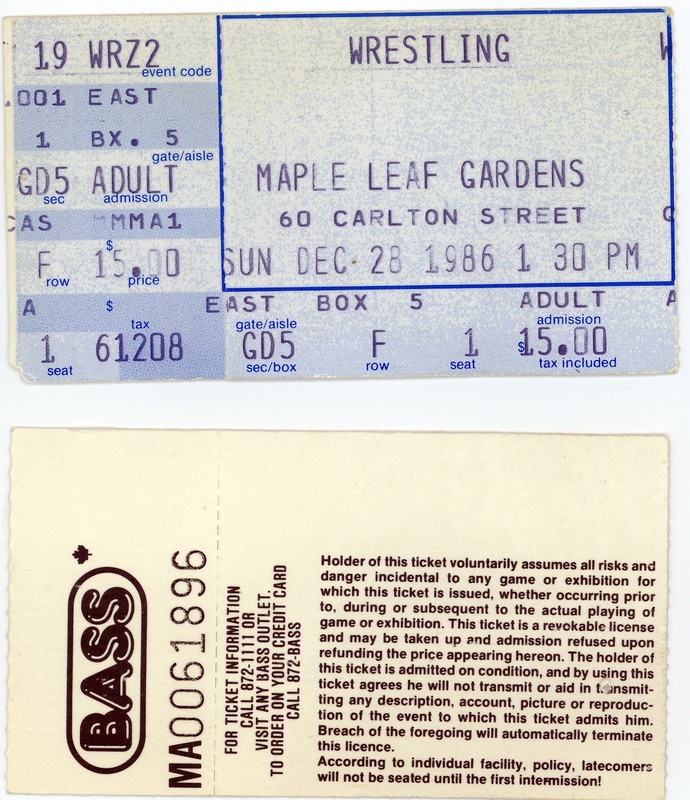 Just a sold-out WWF Maple Leaf Wrestling house show in Toronto. The WWF had a busy day that day. The Fed had four shows running that day. Not just an A, B and C show. Because Toronto was getting an A show matinee, the boys were also booked for a night show in Richfield, Ohio. So, I dressed up in my fanboy clothes, with my WWF trucker hat and a new hand-painted sign. My dad led the way and had his fancypants new auto-focus camera. Seriously, it was a thing of awesomeness. He captured some of the best wrestling pictures I have in my collection on this night. That's why I'm stretching this post into multiple parts -- so I can show off some of the great shots. Let's start with the opening bouts. Pedro Morales, the man who'd held more titles than anyone else in WWF history, was the curtain-jerker on this night, taking on the Red Demon. I suspected Demon was one of referee Danny Davis' gimmicks, given that he was on the card in the Hart Foundation match, but some research suggests I'm wrong. One site tells me Red Demon was Jose Luis Rivera, half of the eventual Conquistadors masked tag team. Morales, despite being barely above jobber status, defeats the hooded Demon. In a rare heel-versus-heel encounter, Moondog Spot battled Tiger Chung Lee. You'd rarely see good guys face other good guys or villains versus villains. Babyface-only contests could be interesting if one guy adopted a heel role after a few minutes of fair fighting. But heel vs. heel matches were usually duds, because frankly, you wanted to see both of them lose. And I don't remember either of these guys being interesting. Spot beats Tiger Chung Lee, somehow. Leaping Lanny Poffo beat Jimmy Jack Funk. Marks like me didn't know that Lanny was Randy "Macho Man" Savage's brother, or that Jimmy Jack Funk was unrelated to Terry and "Hoss" Funk, who'd left the WWF earlier in the year. I don't even remember this match happening. 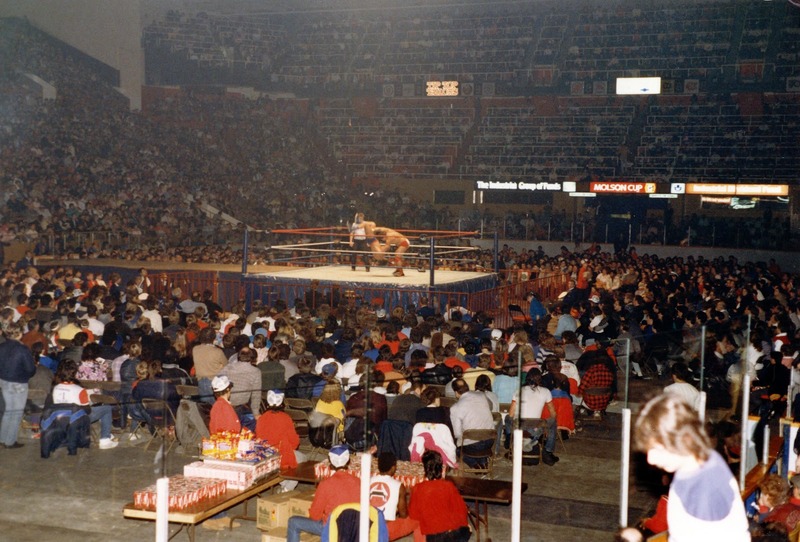 during a WWF wrestling matinee on Dec. 28, 1986. In another mismatch, Canadian strongman Dino Bravo took on Tony Garea. Young Scott did not know about Garea's history as a WWF tag team champion. As far as we could tell, he was just another over-the-hill wrestler with no gimmick who never won matches. Bravo, on the other hand, was a juiced-up Quebecer with a powerlifter's physique. 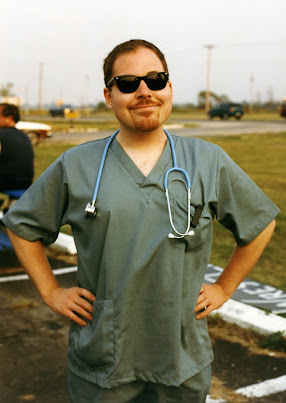 Now, yeah, I was a mark. I was not in the "wrestling is 100% real" camp, nor was I convinced it was 100% set up. As such, I took notice when something looked fake. During this match, one guy whipped the other off the ropes. That guy came off the ropes with a clothesline that went right over the head of his opponent. But the guy took the bump anyway as though he'd taken a solid hit. Huh. That was weird. Anyway, Bravo wins. Those are the first few matches from the ten-match lineup. More in Part Two.